Both the Sterling Trader Pro and DAS Trader platforms we offer have an integrated locate monitor where you can locate shares of hard to borrow securities. Clients can also contact us to request a locate via instant messenger on Symphony or via the live chat feature on our website, www.cobratrading.com , as we have multiple sources for borrows and the locate tool does not yet encompass all of these sources. Locate fees will typically run between 1 and 5 cents per share. In addition, there may be locates available with no upfront cost if you contact us before utilizing the locate tool. 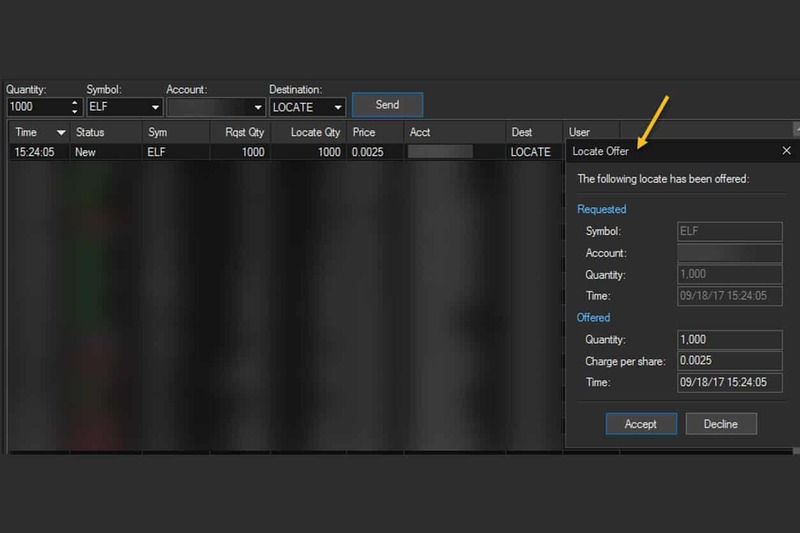 In the Locate Monitor window enter the quantity, symbol, the account you wish to short, choose LOCATE for Destination and click Send. If the security is available you will see this message. Click Accept to agree to the fee and make the shares available to short. Click Decline if you do NOT wish to pay for the locate and have the shares available to short. NOTE: Upon accepting the shares your account will be charged regardless of whether you short the shares. Also, acceptance of the shares does NOT place an order to short them for your account. Once you accept the shares you will see a status update to Filled and the shares are available for you to short. If you receive a reject message and want to check why the locate was rejected you can follow the steps outlined below. Step 1, enter the locate. Step 2, receive the rejection message. Step 3, double click the reject line in the Locate Monitor. Step 4, note if it says Stock is ETB in this area you are free to short the stock without paying the upfront fee. Sterling and DAS allow traders quick access to short locates along with the additional resources available at Cobra Trading. We invite you to contact us and discuss the ways Cobra can best meet your trading needs and earn your business.